When Haggar invented slacks in 1938, they did it with the intention of clothing businessmen for their “slack time” -- when they were away from the office, but not nearly ready to head home. Now they’ve updated those classic looks to arm guys in 2014 with an every-day/all-day look they can rock at the office and out on the town, or out on the country, if you live in the country but still have places to go for happy hour. Because you’re you, Haggar’s offering these historic pieces of business-casualwear for 20% off with the code THRILLSLACK20. 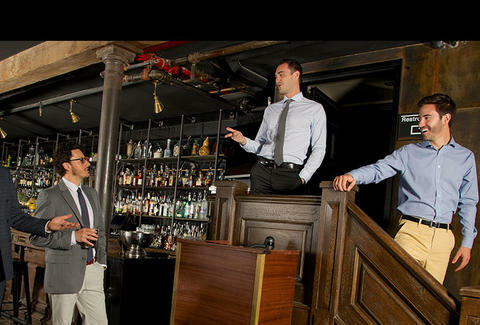 All this slacks knowledge got us thinking about a situation where they’d most come in handy: drinks with your boss, a casual outing that nonetheless has its own protocol. To figure that protocol out, we rounded up bosses across America to give us 16 tips on how to ace these professionally advantageous, high-proof sessions.